basil recipe collection. Indian basil recipes. 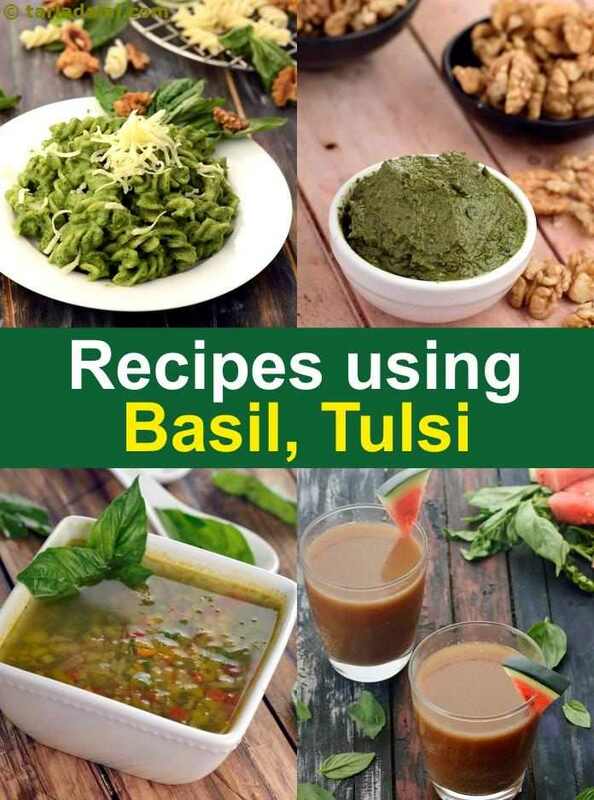 Basil, or Tulsi, is an herb that is used for culinary purposes i.e. for cooking. Even though associated mostly with Italian or Mediterranean cuisines, it actually originated in India. Apart from these cuisines even Thai and Vietnamese cuisines use basil to flavor their food. In India, basil is also known as Tulsi. Here, it is not only considered as a culinary herb but also a religious one and is extensively used due to its healthy properties as mentioned in the Ayurveda. Even though tulsi as such is not used in daily Indian cooking, but due to its medicinal properties and the fresh flavor, it is used in various drinks and tea preparations. Our palate is accustomed to the pleasant taste of tulsi and a great way of having it is to have Tulsi Water or Tulsi Tea. Both these drinks have a fresh tulsi taste but are made slightly different – one by infusing and one by boiling. A hot Herbal tea is the perfect way to rejuvenate anyone who has a cold. The anti-viral properties of tulsi combined with fresh ginger is an age old Indian treatment for common cold. Basil provides freshness to any dish it is added to and also gives it that certain edge that makes it irresistible. The most basic snack that everyone knows is a Tomato and Basil Bruschetta! This winner combination, even though Italian, is now served at many restaurants due to its increasing popularity! You can experiment with toppings and make Ricotta Basil Crostini as well. Party snacks are those which are fun to look at and to eat. Cheesy Corn and Pesto Mini Pizza is the perfect party starter that way! Pesto sauce is made with basil, nuts, olive oil and garlic and makes a great substitute for pizza sauce. Basil can be used to jazz up so many healthy recipes. The sweetness of green peas is really complimented by the taste of basil in this Low Salt Green Pea and Basil Soup. This soup is healthy because it is fibrous and is really good for people with high blood pressure. Vegetable and Basil Soup is a medley of different vegetables where basil lends a very aesthetic vibe and a nice mouth feel. Apart from soups where basil is grinded up and crushed, sometimes it is also used to dress salads and starters. Bean Sprouts and Cucumber Salad with Lemony Basil Dressing has a crunchy vegetables dressed with zesty lemon and fresh basil sauce which is complimented with bean sprouts. The taste of basil leaves gets much more enhanced when torn into pieces. Adding these to a Walnut and Cherry Tomato Salad makes all the difference in the world, to the taste, texture and to the health quotient. Most of us associate basil with Italian food and the first thing that comes to our mind is Pesto! Toss this sauce with some pasta of your choice, with a little cheese on top, you'll get Pesto Penne or pesto spaghetti or whichever your choice is. The basic Margherita pizza, which is representative of the Italian flag, utilizes basil to represent the green. Even Thai food makes use of this wonder ingredient. Thai Green Kodri is a classic example of how basil, coconut and lemongrass come together to form a medley of flavors. Laksa Soup, a Malaysian delicacy, is a mix of coconut milk and vegetable broth with the garnish of fresh basil leaves. Hope you liked this collection of vegetarian basil recipes, scroll down below for more.